Today, April 14, 2015, we recognize Equal Pay Day. 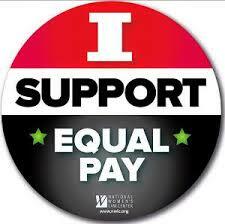 This day marks how far into the year American women must work to earn what American men earned in the previous year. The National Committee on Pay Equality put Equal Pay Day into place in 1996 as a public awareness event to alert people of the gap between men and women’s wages. The White House estimates that full-time working women only earn 77% of what their male counterparts earn. This means women need to work about 60 EXTRA days to earn what men have earned in the previous year! In short, it is important to remember this day each year, as long as this gap continues to exist. This entry was posted in Women's Issues and tagged Equal Pay Day, pay equality, women's issues by Women Impacting Public Policy. Bookmark the permalink.